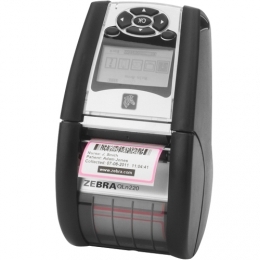 The QLn220 from Zebra is the smallest model in the series thus far. For its size, it impresses with a resolution of 8 dots/mm 203 dpi for media width of 51 mm. Zebra firmly improved its rugged properties with a hard-wearing rubber coating and a larger hard-glass display. It can withstand drops at up to 1.5 m without any damage. Thanks to improved network performance and remote access via Ethernet, you can now adjust various printer properties battery, configurations and firmware quickly and easily. This saves you money and optimises trouble-shooting at the same time. Its intelligent printing technology saves additional costs and energy. Max. printing speed 100 mm/sec. The QLn220 comes standard with a serial and a USB interface optionally, you can select it with Bluetooth and WLAN. Connect this mobile printer to nearly any existing environment. Thanks to its easy-to-open casing, media input can be managed in no time at all.